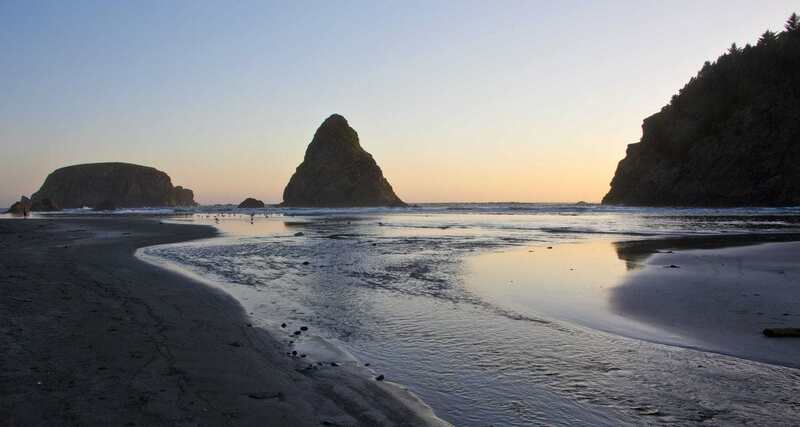 It only takes about 30 minutes to drive between Gold Beach and Brookings, but this stretch of coastline deserves a day of its own, or better yet, a week to get off the road, down a trail or onto one of its secluded hike-in beaches. 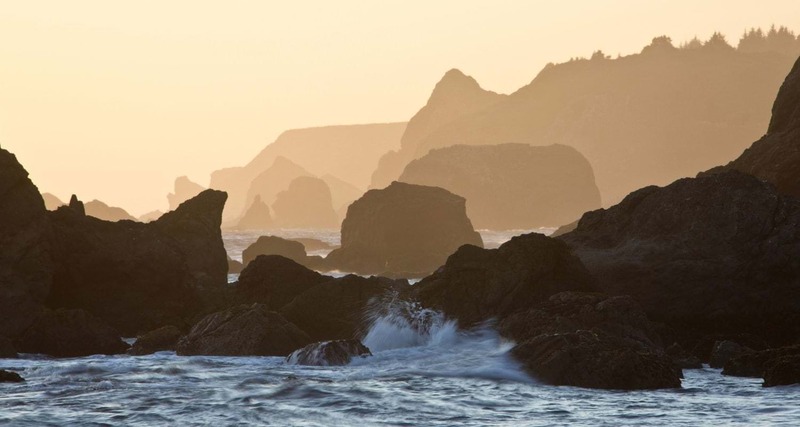 Lingering on this stretch of Coast, you’ll discover magically picturesque coves, rainforest-covered capes, arch rock formations and dramatic overlooks along one of the most beautifully rugged portions of the Oregon Coast. 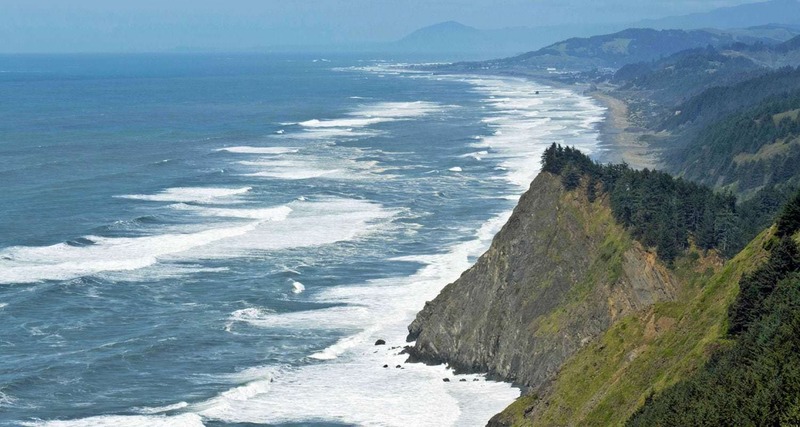 The scenic wonders begin as soon as you start the drive from Gold Beach. Just south of downtown Gold Beach, the highway crosses Hunter Creek, where on the beach at the mouth of the creek is Turtle Rock. Pull over at the highway wayside just ahead to get a look at this rock formation and notice Cape Sebastian looming to the south. As you continue the drive, the highway climbs the cape and you’ll spot the entrance for Cape Sebastian State Scenic Corridor, a good stop whether you want to devote part of your day to a hike or just take in the expansive views. From the south parking lot you have views of up to 50 miles of coastline to the south dominated by Hunters Island just offshore and multiple rock formations on the beach. Even if you’re not hiking, just a few steps down the trail to the west offers expansive views to the north with Humbug Mountain looming on the horizon nearly 30 miles away. If you take the time to hike this trail, it will lead you through thick Sitka Spruce rainforest to the edge of the rocky cape, then around to the beach at Hunters Cove, approximately a three-mile down and back. 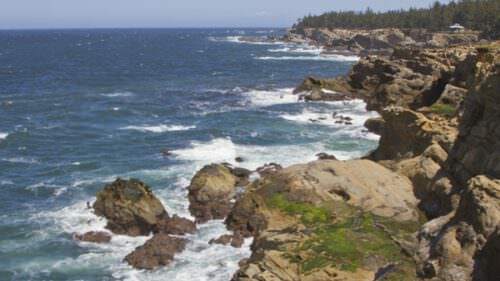 From there, Meyers Beach is just a five-minute drive to the south with easy beach access points from roadside pullouts for viewing or exploring the scenic intertidal rock formations. 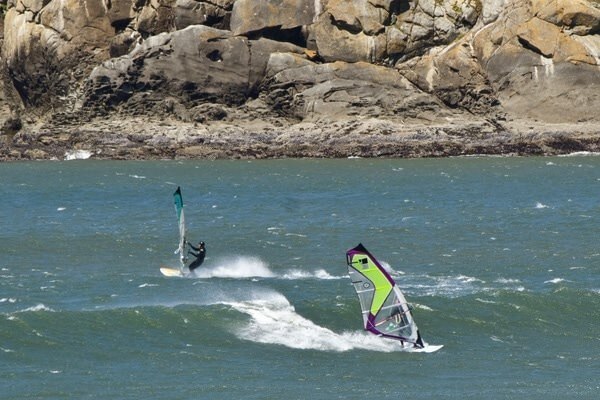 This is one of the top spots for windsurfing on the Oregon Coast, so you’re likely to catch some of the action if winds are right. 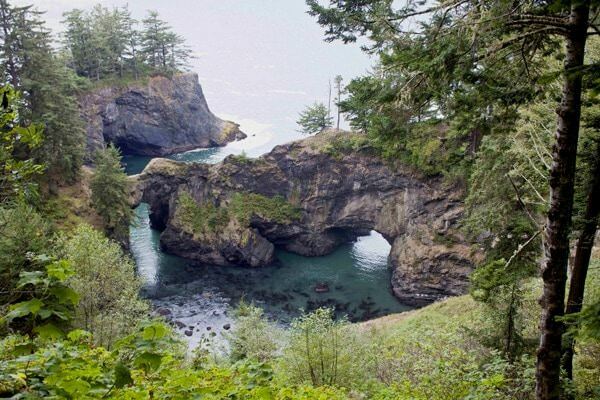 Then you’ll journey to the Samuel H. Boardman State Scenic Corridor, less than a 10-minute drive south, a stunning 12-mile stretch of coastline with several great viewpoints and trailheads. You can easily spend an entire day exploring the scenic corridor. Hiking trails connect all of the viewpoints along the Boardman Corridor so you can choose just about any length of hike you’d like to take, or you can just car hop between some of the best viewpoints. The first must-stop is the Arch Rock Picnic Area. A short loop trail leads around this promontory with captivating views north, south and west. 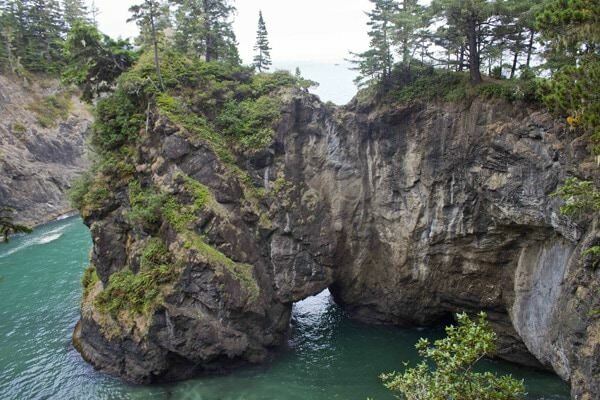 Arch Rock can be seen from the western end of the loop trail just offshore, while north and south vantage points offer views of rocks and small islands some of which manage to support Sitka Spruce trees before the sheer rock walls plunge into the Pacific Ocean. 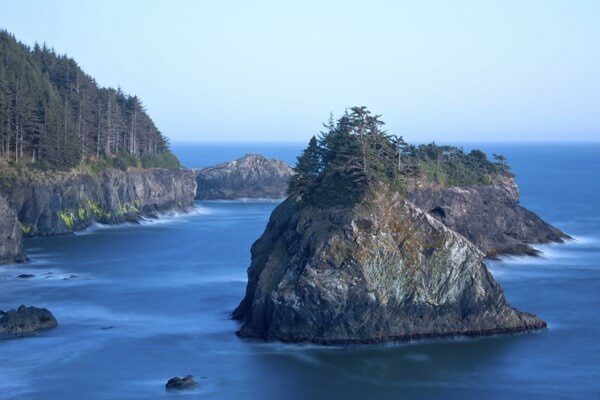 Just a mile from the Arch Rock viewpoint is the trailhead to Thunder Rock Cove (mile marker 345.8). 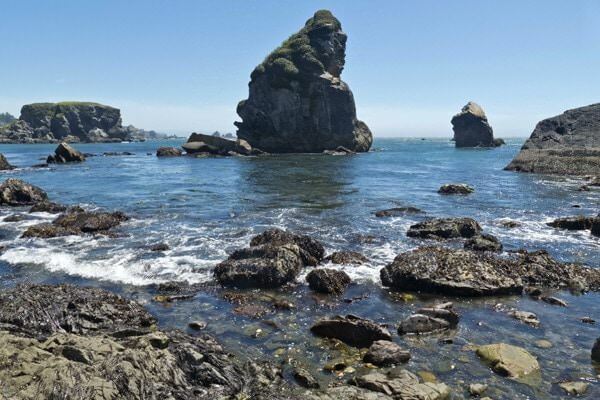 A short walk down the trail rewards visitors with views of a picturesque cove with arched openings in rocks and access to a small promontory with nice ocean views. Continuing further north on this trail leads about three-quarters of a mile to Miner Creek and secluded Secret Beach. Natural Bridges is another easy stop, approximately a quarter-mile further south. Just a few steps from the parking area are views of a fairytale-like cove framed by a basalt rock wall with two arches opening to the ocean creating natural bridges. If you’re interested in more hiking trails, continue south on the highway, where parking areas offer additional trail access for hikes to secluded China Beach; a viewpoint of the Thomas Creek Bridge, one of the highest highway bridges in Oregon spanning the 350-foot Thomas Creek Canyon; and Indian Sands, a unique geological phenomenon of rolling dunes perched on a bluff high above the ocean. At mile-marker 349.1, you’ll find the entrance to the Whaleshead Beach Picnic Area. 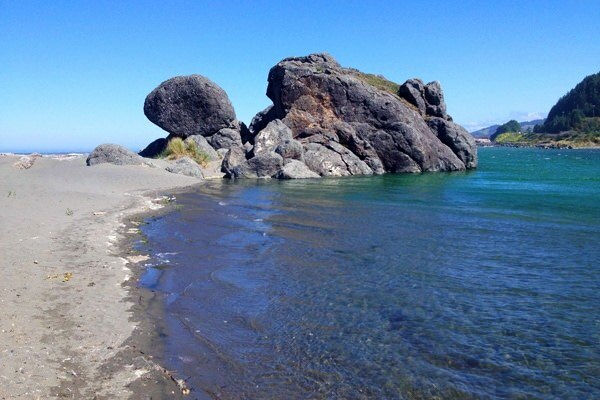 It’s a steep and bumpy drive down a gravel road to the parking area, but it offers easy beach access and views of offshore rocks including its namesake that looks like a whale’s head popping out of the water for a view. The House Rock Viewpoint (mile marker 351.2) offers ocean views and access to trails that will lead you north to Whaleshead Beach or south to Cape Ferrelo. Cape Ferrelo also offers parking, ocean views and trail access including a nice one-mile loop trail that circles the cape, offering great views as it passes through meadows of wildflowers in spring. The southernmost stop in the Boardman Corridor is the Lone Ranch Picnic Area (mile-marker 352.6), one of the most accessible stops along this stretch of coastline. A paved trail leads to the beach with views of many offshore and intertidal rock formations. Plan your visit for a low tide to explore tidepools or walk the extended beach north toward Cape Ferrelo or south toward Black Point. 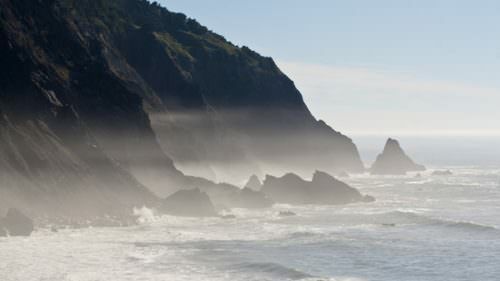 A trailhead to the north climbs Cape Ferrelo where you can connect with its loop trail. Just north of downtown Brookings, Harris Beach State Park offers sandy beaches, scenic rock formations, colorful tide pools and outstanding bird watching. The large day-use area features a paved path to the beach. 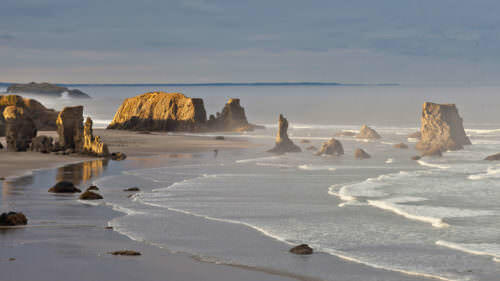 At the south end of this beach is Arch Rock that shelters an intertidal area designated one of Oregon’s seven Marine Garden protected areas. Just offshore from Harris Beach is Goat Island, also known as Bird Island, a nod to the massive seabird population it hosts during the nesting season estimated at more than 100,000 birds. 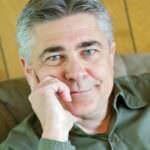 Can you suggest a 2-day Oregon Coast itinerary beginning in Brookings?